If you’re continually waking up with neck pain, it’s time to do something about it. It’s time to get a pillow that’s better aligned to your sleeping position and your mattress. There are hundreds of pillows on the market. Many claim to be able to help with neck pain, but few actually deliver. Both have thousands of positive reviews. Both are priced almost identically. And both really do help with neck pain. So why do we give Snuggle-Pedic the slight edge? Well, their 90 day sleep trial trumps the 30 days offered by Coop Home Goods. And their 20 year guarantee blows the 5 years from Coop out of the water. Snuggle-Pedic’s confidence in the quality and longevity of their pillow is so strong, they provide unprecedented guarantees. But at the end of the day, everyone is different. From your sleep position to your posture, what works for one person may not work for you. You need to try a pillows for yourself, and have peace of mind in the fact that if it’s not right, you can return it easily. Credit to both companies for offering this, but we just feel like Snuggle-Pedic go above and beyond, and therefore, rightly claim our top spot. If you struggle with memory foam, and just want a more normal pillow that helps your neck, this luxurious little cloud is the answer. Two pillows per pack and reasonably priced, it’s certainly worth trialling. Important: This isn’t a bed pillow! (Better make that bold). If you’re willing to try something down the natural healing route, we’ve got no hesitation in recommending this acupressure mat and pillow. The mat features 6210 small acupressure points to increase blood flow throughout your torso, improve your circulation, and help you relax while your body heals itself. The accompanying contoured pillow has 1782 acupressure points, designed to stimulate your neck and upper shoulders, alleviating joint pain and helping eliminate headaches. It’s incredibly simple to use! If you’re just starting out, you’ll want to get used to the feel of the acupressure points. Just place your mat against the back of your chair, and lean against it for around 15 minutes as you work, read, or watch television. You’ll soon become comfortable with sensation of the small, sharp acupoints against your back. Once you’ve grown accustomed to the feeling, you can then try placing your mat down on a bed or sofa and lying on it for 20 to 45 minutes (or however long is comfortable!). Lying down will increase the pressure from the mat, giving you greater benefits: you may feel pleasantly warm while doing this as your back and neck experience greater circulation. Eventually, you’ll work up to placing the mat directly on a hard floor and lying on top of it for 45 minutes or more. Finally, a quick word of caution: some medical conditions may make the use of this mat inadvisable. Check with your doctor before use! Built with the same concept as our top two pillows, and slightly cheaper, the Comfortac rightly makes our top 7. In terms of customer feedback, it’s still early days but the signs are very positive; especially for neck pain. It’s reviews are in currently in the hundreds (not thousands) but if sales and customer satisfaction continue in the same vein, it’s likely this pillow will make it’s way up our rankings over the coming months and years. Here’s something a bit different for you to consider. The Contour Pillow by CR is designed to perfectly match the shape of your head and neck, and most importantly, fill the gap between your head and shoulder. This is obviously a neat solution for side sleepers, but perhaps not ideal for other sleeping positions. And finally, propping up our list the somewhat famous Mediflow Waterbase pillow. We give great credit to the concept and the ability to adjust your pillow simply by adding or emptying water. Of course it’s not everyone’s cup of tea, but it’s worth trying if other options aren’t right for you. Generally, people with back or neck pain report doing best on a firmer mattress, or on an adjustable one (for example, Sleep Number). If your back or neck pain is variable—tending to change in severity or location on a day-to-day basis—you might benefit from an adjustable mattress that can be customized for comfort in response to your daily needs. Research suggests that a “medium-firm mattress” or one that is “custom inflated (self-adjusted)” are optimal for spine health and help keep you in proper alignment. But more importantly, what actually causes neck pain from sleeping? For countless people, nighttime habits play huge role in maintaining a healthy, happy neck. Since most of us spend at least six or seven hours sleeping each night, it’s especially important to maintain good posture and avoid accidentally straining your neck—so, check your sleeping position! Do you sleep on your stomach with your head twisted to one side? You’re probably placing excessive stress on your neck by keeping it twisted for hours while you sleep. 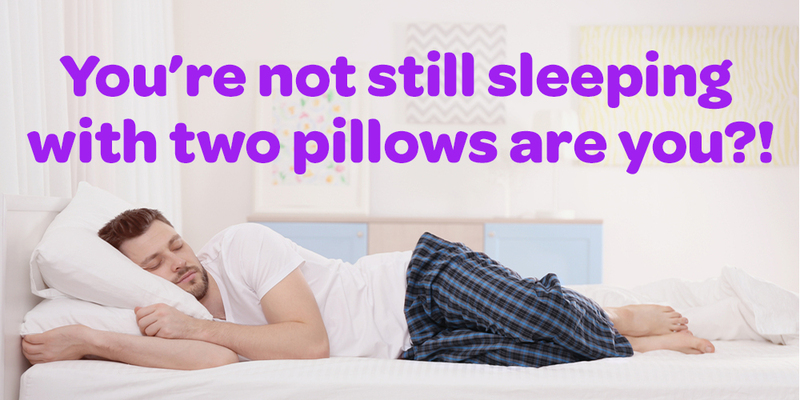 Do you use multiple pillows? If they’re piled up too high, they might be over-flexing your neck. Do you often nod off while watching TV? If your head bobs down or to the side, your neck muscles will become overstretched and strained. There also seems to be a connection between sleep disorders and neck pain: essentially, people who have trouble sleeping and are sleep-deprived tend to have more neck pain. While more research is still needed, this connection is possibly because our muscles repair themselves as we sleep, and consistent interruptions to sleep prevent our bodies (including the neck muscles) from recovering fully from the day’s various strains. So it’s important both to get a full night’s sleep, and also to sleep in a comfortable position that keeps your neck and spine in proper alignment. What else causes neck pain? Most other causes of neck pain are pretty mundane. For example, over time your neck joints may undergo normal age-related wear and tear that manifests as pain or soreness. Even so, treatments, exercises, and stretches can go a long way to alleviating age-related discomfort. Muscle strain is a frequent culprit of neck pain: a lot of suffering can be relieved by making simple changes in your daily routine, posture, and sleeping position. If you spend hours every day sitting in front of your laptop, staring down at your phone, reading, or watching television, odds are your neck muscles are staying in a cramped, static position for too long. Tilting your head to look down dramatically increases the pressure on your neck. When your head is in a neutral position, your neck only has to support the ten or so pounds of your head. But when you bend your neck to look down at your phone, you increase the pressure on your neck to thirty, forty, or even sixty pounds, depending on the angle. Doing so stresses your neck’s sternocleidomastoid (SCM) muscles, as well as your shoulder muscles. 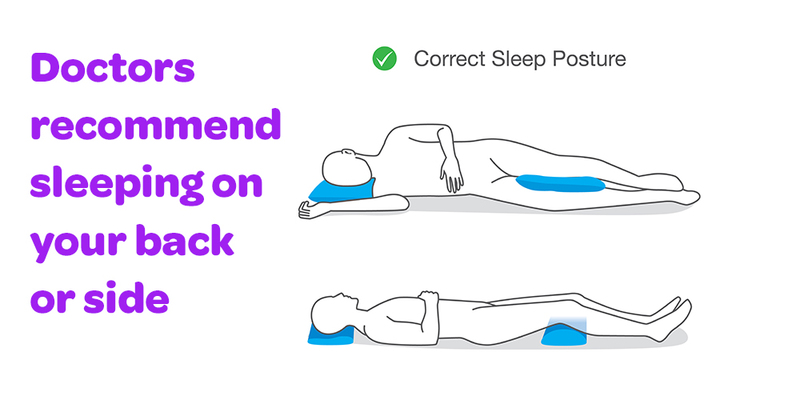 What sleep position should you use if you have neck pain? Doctors recommend sleeping either on your back or side instead of on your stomach. Sleeping on your stomach places additional stress on your body, since it arches your spine and strains your neck, which is typically turned to one side. It’s hard to change your deeply-ingrained sleep preferences, but if you’re a habitual stomach-sleeper, it’s a good idea to try to retrain your body. How? There are a number of techniques you can try, from using a full body pillow to sleeping in a baseball cap—it will likely take some time, effort, and experimentation, but getting away from a stomach sleeping habit will do wonders for your neck and back. Sleeping on your side is an ideal position if you snore or have sleep apnea. Many people prefer sleeping in fetal position, but try not to curl up too much; stretching out more helps relax your back and support your breathing. For added comfort, place a pillow or towel between your knees. If you tend to have pain that travels from your neck down your arm, try supporting your arm with a pillow as well. Finally, try to avoid lying directly on the point of your shoulder. Instead, it’s better to shift slightly backward to spread your weight more onto the larger shoulder blade: for a quick demo and explanation, skip to 7:48 in this video. Sleeping on your back is also a great position and can help relieve acid reflux, though it’s not optimal for snorers or those with sleep apnea. There’s also the potential for a sore lower back. To avoid back pain, put a pillow under your knees to keep them bent and allow your spine to relax into its natural position. Use only one thin pillow to keep your neck in proper alignment and avoid over-flexing it forward. Is it okay to nap on the couch? Nodding off while watching TV is one of the most relaxing feelings in the world…but it can also lead to a cramped, sore neck. It’s best not to make napping on the couch a regular habit. After all, your couch isn’t designed to accommodate and support you while you sleep, and its smaller size may force you to contort yourself as you try to get comfortable. Bottom line: an occasional couch nap is probably fine, but don’t make it a habit, especially if you already have neck pain. First of all, stop slouching and looking down for hours on end! Keep your laptop and reading materials up at eye level, and pay some attention to your posture. If you need to look down, try to look with your eyes only, without bending your neck. It’s also a good idea to get up, stretch, and shift positions every so often—taking regular stretch breaks is a good idea for countless health reasons in addition to alleviating a sore neck. For many people, making small changes to daily habits will go a long way to eliminating neck pain. 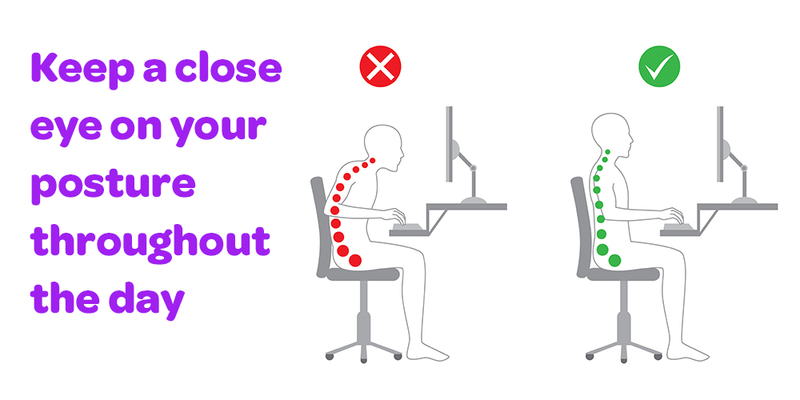 Bad posture often takes time and a lot attention to fix, but you’ll start seeing benefits even if you just remember to mix up how you’re sitting and stand up each hour. Studies also indicate that strength training—especially training that specifically targets the neck muscles—is an effective way of decreasing or eliminating chronic neck pain. Interested in trying out some physical therapy exercises? There are multiple online resources dedicated to teaching you about the benefits of physical therapy, as well as instructing you on basic stretches and strengthening exercises for your neck, shoulders, and back. Of course, keep in mind that there’s no replacement for an in-person appointment with a licensed physical therapist. If you try at-home treatments regularly for several weeks without seeing any improvement, it might be time to seek professional attention. Finally, bear in mind that stress and anxiety often compound the problem of poor posture. When we’re stressed, we tend to tense up muscles such as the upper trapezius; tighter back, shoulder, and neck muscles only lead to more stiffness and pain. Chronic pain sufferers often benefit from practicing yoga or tai chi, or from trying cognitive behavioral therapy (CBT) to decrease stress. Let’s say you’ve woken up with intense neck pain and are looking for the fastest way to calm it down. Or you have a flare-up of chronic neck pain but need it to vanish fast because you’ve got an active day ahead of you. Here are a few tips on reducing neck pain as quickly as possible. We hope they’ll tide you over until you can visit a doctor or physical therapist, or see longer-term improvements from changing your daily habits. First off, you can stabilize your neck during sleep by wrapping it in a folded pillowcase; for a demonstration of this technique, jump to minute 4:00 on this video. The extra support will prevent your neck from flexing and bending too much while you sleep and will help you avoid exacerbating the injury. Is your pain located at the upper part of your neck, right at the base of your skull? If so, this physical therapy video can help out! Try massaging the area for several minutes and performing the recommended stretches and exercises—such as chin tucks, which can be done hourly—for some quick relief. In an additional video, physical therapists Bob Schrupp and Brad Heineck explain a few more quick fixes for a tight or sore neck. This video will be most helpful for people with neck muscle strain, such as from spending too much time sitting in poor posture or looking down at a laptop. Finally, painkillers have their place in the treatment of neck pain. Over-the-counter medications such as ibuprofen (Advil, Motrin), naproxen (Aleve), or acetaminophen (Tylenol) provide quick relief for many people suffering from neck pain. Ibuprofen is an anti-inflammatory that works to reduce inflammation from either an acute or chronic injury. If you’re not seeing improvement after a week, it might be time to make a doctor’s appointment. Naproxen has similar effects as ibuprofen but is longer-lasting. Acetaminophen, in contrast, is not an anti-inflammatory but a pain-reliever. It is generally a better, safer choice for people who are already on blood thinners—but be careful not to overdose. The maximum daily dose of Tylenol is 3000 milligrams. Use acetaminophen according to the official guidelines to avoid harming your liver. If you prefer to keep things natural, try out turmeric, a spice with anti-inflammatory properties. You can take a supplement to get the amount that you need, or you can try simply incorporating it into your cooking on a regular basis. Consuming this spice consistently may help you stay pain-free. Keep in mind that you’ll have to use quite a bit of turmeric to enjoy its anti-inflammatory properties: around 500-1000 milligrams of curcuminoids per day, or 2.5-5 teaspoons of fresh or ground turmeric. Whatever you decide to take for your pain, you should first check that it won’t have any bad interactions with other drugs you’re taking or conditions you might have. You should be wary of taking pain-killers over long periods of time to avoid damaging your kidneys or liver, or raising your blood pressure. If you find that your pain continues for longer than a week, check in with your doctor or pharmacist to see if it’s safe to continue using medication. Should you see a doctor for your neck pain? First thing’s first: there’s no substitution for a thorough, in-person evaluation by your primary care doctor or an orthopedist. If you’re experiencing pain, including neck pain, after a recent accident or injury, it’s best to seek professional medical advice. Whiplash from a car crash, for example, often leads to a sore neck and may require prescription medication or physical therapy. Neck pain can also be caused by arthritis, bone spurs in the neck, fractures, herniated discs, or nerve compression. radiating pain: pain that radiates or shoots down one arm (sometimes combined with numbness or tingling in the hand) could mean you have a herniated cervical disc that is placing pressure on a nerve. fever and headache: bacterial meningitis often presents as a fever, headache, and stiff neck and should be treated quickly. swollen glands in the neck: this symptom can appear due to an infection or tumor. chest pain: heart attacks can result in neck pain alongside chest discomfort. over-flexibility or instability of the neck: if your neck can suddenly bend or extend in new ways, you may have torn ligaments or a fracture. Your primary care physician or an orthopedic specialist will be able to identify or rule out certain problems and refer you to physical therapy if necessary. If you think your neck pain is caused by a herniated disc or thoracic outlet syndrome, you might benefit from this video, produced by physical therapists, on exercises to relieve pain from pinched nerves. Improving your posture is crucial to reducing this kind of pain, so you’ll learn some exercises to remedy posture problems and undo the damage done from hours of sitting. You’ll also find advice on better office ergonomics, driving position, and sleeping position. TMJ (temporomandibular joint) disorder is another root cause for some neck pain and often requires medical attention. This disorder is centered on the jaw, and may arise from genetics, arthritis, or injury. Problems with the temporomandibular joint often result in stress to nearby muscles as well, including those in the neck and shoulders. If you experience concurrent symptoms like jaw pain, difficulty chewing, or locking of the jaw joint (either open or closed), your neck pain may be TMJ related. If these symptoms persist, it’s a good idea to make a doctor’s appointment. Treatments for TMJ disorder include: wearing a personalized mouth guard at night, performing physical therapy exercises, avoiding activities that exacerbate pain, learning stress-relief techniques, and in some cases, undergoing surgery. Before your doctor’s appointment, take notes on the times, locations, and severity of your pain over the course of several days or longer, which will help you and your doctor identify trends and potentially pinpoint the cause. Fortunately, most neck pain is not medically serious or indicative of a huge problem, and countless people succeed in easing mild to moderate neck pain themselves with at-home treatment. Read on to learn more about common neck problems and the best ways to solve them.